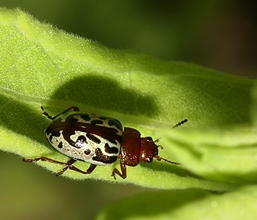 Identification: Adults are oval, similar in shape to ladybugs, but they are leaf eaters. Head and thorax is dark metallic color; wing covers are ivory with dark splotches, dots, lines, and other markings that resemble a Rorschach test. These markings vary greatly. Antennae, legs, and mouthparts are dark in color. Biology and life cycle: Complete metamorphosis. Adult females lay eggs on leaves and stems of plants. Larvae hatch and feed on foliage and then drop to the ground to pupate. Adults emerge and also feed on leaves from May to September. Overwinter in the soil as pupae or young adults. At the slightest disturbance, these beetles tend to drop off the tree to the ground to hide, which works well since they are about the color of brown leaves. Habitat: Forests, parks, and large commercial properties. Economic importance: Not significant. These beetles primarily attack and quickly defoliate sick, stressed trees. Feeding habits: The larvae and adults feed on the foliage of dogwood, basswood, elm, and other shade trees. Natural control: Maintain tree health. Bacillus thuringiensis products work if sprayed early in the insect's life cycle. Plant oil products also work. Insight: This very destructive insect is not often seen in Texas. This beetle is a good example of how a sick plant attracts insects that recycle it back into the soil. They were stripping the green out of the leaves in a hurry. The maintenance crew sprayed with pyrethrum, Bacillus Thuringiensis 'San Diego' and horticultural oil. At the time we didn't yet know about the power of citrus oil. We were all frustrated about how to control these pests until we finally followed our own advice and realized the cause of the infestation. These old American elms were in terribly poor health. They had in the past been hit by lightning, broken by wind storms and brutalized by the entrance road construction when the project was built in the late 1980's. The calligrapha beetles were just doing their job of helping nature remove these terminally ill trees. We got the message and helped. The trees were removed (improving the look of the area) and we haven't seen a calligrapha beetle since.